Datacrons are an additional optional element of SWTOR and are essentially hidden items you search for. The benefits of finding a Datacron are that one of your characters statistics will be permanently increased and you will gain a Codex entry (which gives you a little XP) relating to that specific Datacron’s history. 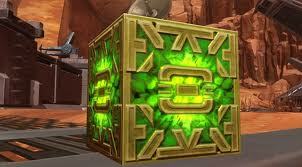 The downside is that they are hidden throughout the worlds of SWTOR in quite hard-to-reach places. Fortunately they glow unusually brightly in order to better allow you to locate them, however getting to them almost always involves going off trails and problem-solving. The big challenge with Datacron’s is not necessarily finding them, but is working out how to get to them. Lament not my little Warriors, SWTOR Spy has compiled a comprehensive list of all the Datacron’s locations wherever they have been scattered and arranged by planet. It includes a list of the benefits awarded by each Datacron, the coordinates they can be found at on that specific world, and even a link to a walkthrough in case you’re having problems solving a particularly fiendish puzzle.